I’ve been promoting a lot of affiliate products over the years, but in my opinion, Russell Brunson’s ClickFunnels is the most lucrative affiliate program out there for many internet marketers. But to unlock this potential, you really need to have a good understanding all the opportunities that ClickFunnels provides. And then use your strengths as a marketer to promote your chosen method like crazy. In this first article of the series, I’m going to tell you all you need to know about share funnels, which I feel is the best way to make money with ClickFunnels. It’s a built-in feature of ClickFunnels that can really boost your affiliate commissions if you do things right. Before we begin, let me start by explaining why I have ClickFunnels ranked as my #1 affiliate program to promote. First of all, I really like the product itself. While ClickFunnels certainly has some flaws, I’ve been using it since 2015 in my own business. And it does exactly what it says it will do which is help me build sales funnels that increase the value of each of my customers. I go into more detail in my ClickFunnels review. Also, I really like what Russell teaches. Sure, he can come off as super salesy at times, but I’ve read both his books (DotComSecrets & ExpertSecrets) and came away impressed with each. His message really resonated with me, and I was able to find a lot of actionable ideas in them that I’m using now in my own business. In terms of the ClickFunnels affiliate program itself, you will earn 40% recurring commissions on sales of ClickFunnels, as well 40% commissions on all the related products in the ClickFunnels ecosystem. This includes both of Russell’s books and other continuity programs like Funnel Scripts and Funnel University. Each product has its own funnel with upsells and downsells designed by the funnel master himself, Russell Brunson. ClickFunnels also uses what’s called a sticky cookie. Which means that once a customer has clicked on your link, they have your sticky cookie and you will get commissions on ALL products they purchased through any funnel they happen to go through. Not only that, but you also get 5% commissions that any ClickFunnels affiliates who sign up under you get. And finally, ClickFunnels has one of the coolest bonus prizes, which is paying you to lease your own dream car. If you signup 100 paying ClickFunnels customers, they will pay $500 a month towards the lease of your dream car. And if you get 200 signups, they’ll pay you $1000 per month. Don’t think it’s achievable? Check out this page which shows all the current dream car winners. Am I a dream car winner yet? No, not yet but it’s definitely a goal of mine! However, I’ve just passed the $11,000 mark in lifetime earnings and I’m looking to bump this up a notch in 2019. How do Share Funnels work? Share Funnels are one of the coolest features of ClickFunnels. Basically, every funnel you create in your account has a unique share funnel url which you can share with others. There’s a video that explains how things work, and at the bottom is a preview of all the steps in your funnel. If a person is an existing ClickFunnels user, your funnel will get added to their account. But if the person is not, then it will prompt them to sign up for the 14-day trial account of ClickFunnels in order to access the funnel. And if they stay on as a paying member, then you get the affiliate commission. This is super powerful, and it’s one of the big secrets to making big money as a ClickFunnels affiliate. Here are the steps to get your share url. Scroll down till you see the Share This Funnel URL blue box. Copy your share url and share! Now that know how share funnels work, how do you go about making money with them? Here are 7 examples of ways you can promote ClickFunnels by using them. These are just some ideas off the top of my head. Hopefully, you can use these as inspiration for your own ideas, and get yourself your own dream car. If you’re just starting promoting ClickFunnels, then the Affiliate Business in a Box (BiB) method is a good way to start. Basically it’s a fully self contained share funnel that you can promote to others via solo ads. As you drive traffic to it, you will collect leads and get ClickFunnels trials as people use your BiB. I’ve written more about this strategy in my Udimi case study and I’ve just developed a brand new Viral Affiliate Marketing Funnel that’s working really well in my initial testing. The best way to promote ClickFunnels is to get your hands dirty with it and start using it in your own business. So if you have a product or service to sell, use ClickFunnels to create your sales funnel and start selling your product. Just make sure to advantage of the ability to create upsells and downsells to get even more value out of each customer. Then you can pay more for traffic, and start really kickstarting your sales. This is what 8 figure marketer Peng Joon did to make a killing with his best selling Content Multiplier Formula. He created an amazing 4-step sales funnel in ClickFunnels to sell the product, along with 2 upsells. And he turned that into a over $10 million in sales. Share funnels make excellent content upgrades. If you can legitimately say you’re sharing a sales funnel that legitimately helped your business, then that will get people exciting to signup to your list and add your funnel to their account. Which means you can start building your email list, and earn ClickFunnels commissions in one go. There’s really a lot of ways you can go with this idea. The key is to make sure the content you’re attaching the content upgrade to is super relevant to the funnel you want to share. You can see how I’m doing this myself on all ClickFunnel related posts on this site. As a lead magnet, I’m using a membership course funnel by Dream Car winner Rachel S. Lee. It gets a good opt-in rate percentage and gets me affiliate commissions too. 4) Create funnels for local businesses in your area. This idea requires a little legwork on your part. But if you’re willing to hustle, this can be extremely lucrative. As you know, many local businesses don’t have the budget or know how to create a good web presence to sell their service. So what you do is create a funnel for their specific business and then sell it to them for a fixed price… let’s say $500 dollars. Once they agree, you give them your share url and have them sign up for a ClickFunnels account to use it. What’s great about this, is if your sales funnel is working for them, they are going to stay ClickFunnels members for a long time. And you’ll get to enjoy the recurring commissions. The key is to scour your local area real estate agents, dentists, jewelers or any business that sells high ticket items or services. As an example, here’s a share funnel you might use to promote to Chiropractors in your area. ClickFunnels has become so popular that I’m seeing the term funnel consultant bandied about a lot. Why not become one and create your own business that makes sales funnels for others? ClickFunnels makes it easy to create these funnels and the more you create the easier it gets. And once you establish your service, and get more work, you can easily outsource to work to someone else. I recently posted a job offer on Upwork looking for ClickFunnels landing page designers and I got a bunch of proposals. So the demand is definitely out there. For every funnel you create and sell, remember to use your share url, to earn those bonus commissions. 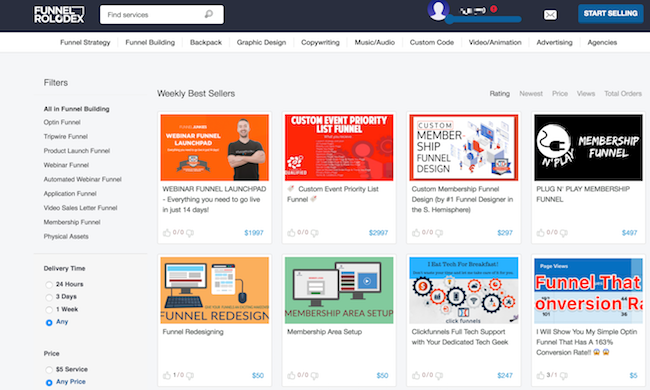 ClickFunnels also launched a service for selling funnel building services as well. It’s called the Funnel Rolodex and it’s specifically for people in the ClickFunnels community to market their services. It’s a great way to earn extra money and get more visibility to your service. 6) Find other successful sales funnels out there and replicate them. Every business that sells something has some sort of sales funnel. Find some good ones and replicate them in ClickFunnels. As you’re doing so record yourself on video or write about the experience in a blog post. By doing so you can demonstrate how easy ClickFunnels is to use. Include the share funnel link to your finished product so your readers or viewers can verify your work. If you show them how easy ClickFunnels is to use, they will definitely sign up to see what it’s about. For example, lets say you’re a fan of Grant Cardone. You could take a look at the funnel he used to sell his Millionaire Booklet product. Study it, learn how it works, and then demonstrate it to your viewers. I’ve compiled a bunch of these share funnels into a free resource called the CF Share Funnel Library. If you’re interested in getting a copy, you can find it inside my Affiliate Profits Mastermind Facebook group. For certain niches, this can be a great idea. As you know, a good email marketing campaign requires you to provide consistent value to your readers to keep them opening and engaging your emails. You could easily drop your share funnel url as part of a case study or soap opera sequence. Really, the possibilities are endless. Share funnels are one of the best ways to get people to cookie with your ClickFunnels affiliate link. This is your key to making more money with ClickFunnels and getting yourself that dream car and maybe even the exclusive 2 Comma Club. Ready to start making share funnels? Then first sign up for a ClickFunnels account and take advantage of their 14-day Free Trial. Then sign up for an affiliate account so you can start earning commissions. Have you had any luck promoting ClickFunnels in this way? Feel free to share your results in the comments. Did this ClickFunnels affiliate guide get you interested in taking that free 14-day ClickFunnels trial? Why not get some extra help to start your ClickFunnels journey with my exclusive ClickFunnels bonuses. By grabbing my bonuses, you will save yourself so much time and provide a ton of extra value with a minimal amount of effort on your part. I guarantee they will help you achieve better success with promoting ClickFunnels as an affiliate. Take a look at my ClickFunnels bonus page for more details on the above bonuses and how to get them. Awesome post! Do you know if someone shares with me a funnel they built and then I share it who gets the sign up commission from the people i shared it to? Me after sharing it or the creator ? Good question Anarhlia. So if someone shared a funnel with you using their share funnel url, and you shared that exact same url with another person, then the original creator would get the affiliate commission. However, when someone shares a funnel with you and it gets added to your account, then what you should do is go into your account and get that funnel’s share funnel url. This will be different than the one you were sent by the creator originally. Then if you share this new url, you will get the affiliate commission. When did you start this affiliate program? It is hard to tell in your numbers the time length and how many subscribers you have enrolled. Do you still receive commission money when you qualify for the car lease payments? Hi Elle. I’ve been an affiliate for a few years, but I haven’t really pushed super hard to promote ClickFunnels till more recently. For example, I only just recently put together my ClickFunnels bonus package. And yes, the payments for the car lease ($500 or $1000) are on top of whatever your ClickFunnels affiliate earnings are. Can you do affiliate marketing on the basic package or must you subscribe to the Actionetics and Backpack too? And what happens to your email leads if you do not have Actionetics in place? Great question Carol. Yes, you don’t even need to be paying customer to promote ClickFunnels as an affiliate. And the $97 a month plan works perfectly fine for promoting ClickFunnels as well. ClickFunnels stores your contacts in their database whether you have Actionetics or not. You just can’t send followup sequences to them using Actionetics (since you don’t have access to it). Instead you’d have to integrate with another email service if you want to send followup emails to your contacts. So of course websites aren’t dead. That’s just a ClickFunnels marketing message. But if you’re trying to promote a service of yours and you need a sales funnel, then yes ClickFunnels is ideal for that.